Traffic-Aware Cruise Control maintains your set cruising speed whenever a vehicle is not detected in front of Model 3. 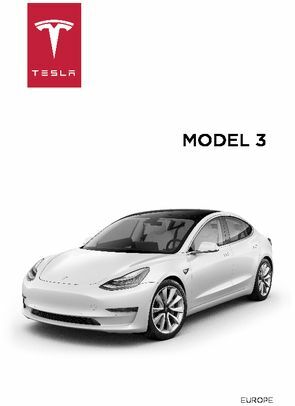 When cruising behind a detected vehicle, Traffic-Aware Cruise Control accelerates and decelerates Model 3 as needed to maintain a chosen following distance (see Adjust the Following Distance on page 76), up to the set speed. Traffic-Aware Cruise Control also adjusts the cruising speed when entering and exiting curves. You can manually accelerate at any time when cruising at a set speed, but when you release the accelerator, Traffic-Aware Cruise Control resumes cruising at the set speed. Note: If traveling 50 mph (80 km/h) or faster, Traffic-Aware Cruise Control requires that you be in a passing lane in order to pass a vehicle. If you are in a non-passing lane (to the right of a vehicle in right-hand traffic or to the left of a vehicle in left-hand traffic), Traffic-Aware Cruise Control prevents you from passing vehicles. Instead, Model 3 slows down to match the vehicle's speed as if it were in the same lane as Model 3. If you press the accelerator pedal to pass the vehicle, TrafficAware Cruise Control continues to allow you to pass vehicles in the non-passing lane until you either change lanes or cancel and resume cruising (at which point it again prevents you from passing vehicles in a non-passing lane again).